2636 ⊙ German Reich - 1933 / 45, extensive used collection, in the number of a major listing complete in the lighthouse hingeless illustrated album, stamp without guarantee. With also Wagner set 1933, charity souvenir sheet Nothilfe 1933 in original size (margin with tear), Chicago travel 1933, trade set, Ostropa souvenir sheet 1935, olympic games souvenir sheet pair, Hitler souvenir sheets, Munich Riem overprint block, Nürnburg-race on letter pieces with special cancel, Gdansk farewell series and so on. Favorable valued! 2637 ⊙ German Reich - 1933 / 45, superb used collection nearly complete in Lighthouse illustrated album. With also the center piece from the charity souvenir sheet neat cancelled in perfect condition (Michel 2400,- Euro), Chicago travel 1933 (Michel 1000,- Euro), Wagner series, professions set, winter relief series, Hitler souvenir sheets, Riem overprint block with first day special cancel, Nürburgring race, brown and blue ribbons, Gdansk farewell series and so on. A very nice object with very high catalogue value, favorable valued! 2638 ⊙ German Reich - 1933 / 45, nice and extensive used collection, nearly complete with numerous sought-after issues, clean and maintained in the Lighthouse-Ringbinder formed. With also Chicago travel 1933, 3-25 Pfg. Wagner, professions set, Ostropa souvenir sheet with appropriate special cancel from Königsberg expertized Schlegel BPP, folk costumes set, olympic games souvenir sheet pair with appropriate special cancel, winter relief series, all fours Hitler souvenir sheets, Nürburgring race, brown and blue ribbons, Munich Riem overprint block and so on. A very nice and Cultivated object with very high catalogue value! 2639 ⊙ German Reich - 1933 / 45, extensive used collection, in the number of a major listing except for souvenir sheet 2 complete in the safe hingeless printed form ring binder. And, of course, all good issues including Chicago travel 1933, Wagner set, trade set, Ostropa souvenir sheet 1935 with appropriate centered special cancel from Königsberg, olympic games souvenir sheet pair, Hitler souvenir sheets, Munich Riem overprint block with First Day special cancellation, winter relief series, brown and blue ribbons, Nürnburg-race, Gdansk farewell series and so on. Favorable opportunity to acquire one nearly complete collection! 2640 ⊙ German Reich - 1933 / 45, extensive used collection Third Reich, nearly complete in the KABE illustrated album with a lot of better issues as for instance Wagner set, 2-4 RM. Chicago travel, professions set, Ostropa souvenir sheet 1935 with appropriate special cancel from Königsberg, olympic games souvenir sheet pair with appropriate special cancel, Hitler souvenir sheets, winter relief series, brown and blue ribbons, Nürnburg-race, Gdansk farewell series and so on. A superb collection with very high catalogue value! 2641 ⊙ 1 German Reich - 1872 / 1923, extensive used collection in the Lindner T hingeless printed form ring binder with a lot of better issues, mixed quality, with numerous superb and extremely fine copies. With also an interesting part breast shields including Michel no. 1, 6, 10, 11, 12 / 13 with canonical handwritten cancellations, 14 / 15, 16 / 23, Germania period including mark values, with also 5 Mk. Reichspost, as well numerous inflation issues, these unchecked. An interesting object with enormous catalogue value, reasonable on net base valued! 2642 ⊙ 01. Nov German Reich - 1872 / 1923, rich collection, almost exclusively used collected in the Lighthouse illustrated album, mixed quality, with much perfect material and better values. Thereby also extensive part breast shields including Michel no. 1 / 11, 12 / 13, 16 / 23, 26 / 27, 29 / 30, penny / pennies and crown / eagle, extensive part Germania-time including mark values, as well an extensive part inflation issues and subsequent official stamps. Favorable valued collection with enormous catalogue value! 2643 ⊙ Third Reich - 1933 / 45, extensive cancelled collection, in the number of a major listing except for souvenir sheet 2 / 3 complete in the lighthouse hingeless illustrated album with all good issues including Wagner set in A and B-perforation, Chicago travel 1933, professions set, olympic games souvenir sheet pair, Hitler souvenir sheets, Munich Riem overprint block, winter relief series, brown and blue ribbons, Nürburgring race, Gdansk farewell issue and so on. Favorable valued collection with enormous catalogue value! 2644 ⊙ German Reich - 1923 / 32, extensive used collection Weimar Republic on KABE hingeless preprinted pages with plenty of better issues. With also wood-pigeon 1924, airmail 1926, I. A. A. 1927, help in need sets from 1924, 1925 / 28 and 1930 / 32, South America flight 1930, official stamps and so on. Favorable! 2645 ⊙ 53/66 German Reich - 1872 / 1945, very extensive used collection in the Schaubek illustrated album with plenty of better issues including key values, slightly mixed condition, as well a strong part breast shields with Michel no. 1 / 8, 10, 11 expertized Sommer BPP, 12 / 13, 16 / 23, 26, 27 a, 28, 29 / 30, Reichspost set (Michel no. 53 / 66), inflation very extensively present, Weimar with wood-pigeon 1924, airmail 1926, help in need sets, South America flight 1930, International Postage Stamp Exhibition souvenir sheet 1930 with special cancel, Polar Flight series, Third Reich nearly complete, Chicago travel 1933, trade set, Nürnburg-race, Gdansk farewell series, souvenir sheets with useful issues and subsequent an extensive part official stamps. Favorable valued collection with enormous catalogue value! 2646 ⊙ I/III German Reich - 1872 / 1923, extensive used collection with numerous rarely issues in the safe ring binder. As well a very good part breast shields with Michel no. 1 / 7, 11, 14 / 15, 16, 21 a, penny / pennies and crown / eagle with colours and minor shade including expertized values, Germania-time including mark values extensively present, airmail set 1912 (Michel no. I / III), yellow dog 1912, E. EL. P. 1912 with special cancellation (10 Pfg. Expertized Buehler), extensive part inflation period issues including numerous expertized values, with also Rhine-Ruhr-aid expertized Infla / Berlin, to the issues the hyperinflation. An impressive object with substance and very high catalogue value! 2647 ⊙ German Reich - 1933 / 45, extensive used collection, in the number of a major listing complete with all rarities in the Schaubek illustrated album. With also Chicago travel 1933 (Michel 1000,- €), Wagner set, the very scarce charity souvenir sheet Nothilfe 1933 clean genuine used \"BERLIN 28.12.34\" in original size, central fold and there a little separated, margin blotched (Michel 13000,- €), Ostropa souvenir sheet 1935 with appropriate special cancel, all Hitler souvenir sheets, Riem overprint block with first day special cancel, winter help work sets, brown and blue ribbons, Nürnburg-race, Gdansk departure set, lovely letter pieces and so on. Favorable opportunity to acquire one complete collection Third Reich! 2648 ⊙/ 01. Feb German Reich - 1872 / 1945, rich collection in the Borek illustrated album with plenty of better issues, mixed quality, with many superb and extremely fine copies. With also Michel no. ¼ used, 3 unused, 6 on piece, 8 used, 10 / 11 used, 14 / 15 used, a number of values great breast shield, extensive part Germania period including mark values, much inflation, Weimar well-staffed with wood-pigeon 1924, airmail 1926, all help in need sets from 1924 / 32, I. A. A. 1927, 1-4 RM. Zeppelin, lots of Third Reich, also the stamps from the charity souvenir sheet Nothilfe neat cancelled, 4 RM. Chicago travel mint never hinged, Wagner set, Ostropa souvenir sheet 1935, further souvenir sheets issues, winter help work sets, brown and blue ribbons, as well numerous further better issues. Favorable valued collection with enormous catalogue value! 2649 ⊙/ German Reich - 1933 / 45, rich collection, in the number of a major listing complete in the Schaubek illustrated album, mixed quality, with also the scarce charity souvenir sheet Nothilfe 1933 genuine used \"NIEDEROLM 3.12.33. \" in the original format with margin defects (Michel 12000,- €), Chicago travel 1933, Ostropa souvenir sheet 1933 as center piece, all further souvenir sheets, winter relief series, brown and blue ribbons, Nürnburg-race and so on. In addition to it subsequent still numerous issues German occupation II. World war with complete sets. Favorable valued! 2650 / German Reich - nice lot on stock cards with plenty of better issues, as well much mint never hinged material, better Germania values including peace prints, good part Weimar with useful sets, help in need sets, Third Reich with 25 - 40 Pfg. Wagner, folk costumes set, Gdansk farewell series and so on. Favorable! 2651 Third Reich - 1933 / 45, lovely mint never hinged quality collection in the Lindner T hingeless printed form ring binder, nearly complete. 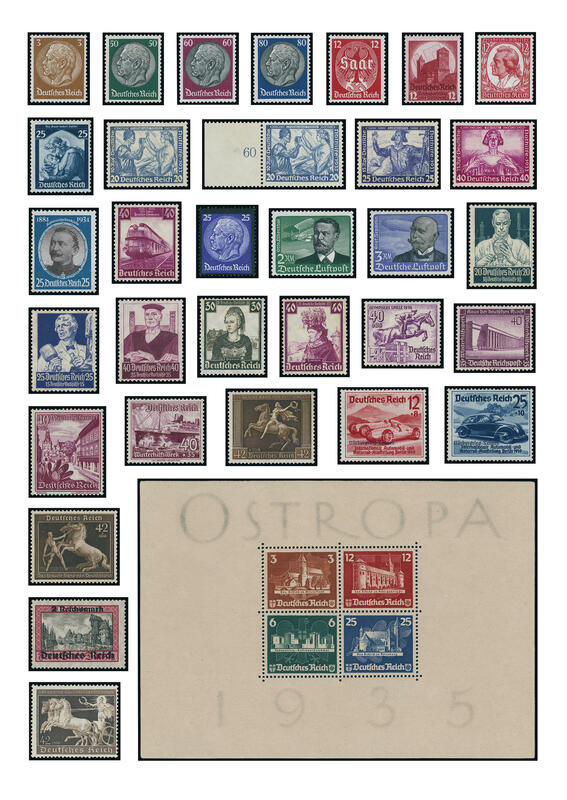 Also the good Wagner set in A-perforation (top values expertized Schlegel BPP), all five Wagner values in B-perforation, airmail 1934, professions set, Ostropa souvenir sheet 1935, olympic games souvenir sheet pair, all Hitler souvenir sheets, brown and blue ribbons, Riem overprint block, Nürnburg-race, Gdansk farewell series and so on. A wonderful quality object with very high catalogue value! 2652 German Reich - 1933 / 45, very nice and more cultivated mint never hinged inventory with numerous sought-after issues, many better sets and so on. With also airmail 1934, winter relief series, numerous brown and blue ribbons, Nürnburg-race, Gdansk farewell issue three times and so on. A more cultivated inventory, perfect for liquidation! Michel approximate 15700,- €. 2653 ✉ German Reich / shipÂ´s mail - interesting collection from shipÂ´s mail letters and cards with attractive documents, sought-after cancellations and so on. Thereby also cover with 10 Pfg. Germania with manuscript cancellation \"NAURU 29. II. 06\" with sea mail cancel the JALUIT-LINE to Jaluit / Marshall Islands, numerous further interesting cancellations, nice sea postcard from 1909 from Lüderitzbucht / German Southwest Africa and so on. Also letter pieces and stamps German Reich respectively German colonies with shipÂ´s cancel are available. A magnificent object! 2654 ✉ German Reich / GERMANIA - rustic inventory from cards, postal stationery and covers packed in a carton with a lot of interesting material, as well attractive frankings, various postage steps and use form, interesting cancellations, package cards, nice picture postcards including greatings from. ., private postal stationery, documents abroad used, including to Egypt and so on. Great treasure trove for specialists with in total over 380 documents. 2655 x German Reich - interesting and extensive inventory packed in a carton, mostly on stock cards, all issues Third Reich with lots of better values, souvenir sheets including Ostropa souvenir sheet 1935, several olympic games souvenir sheets 1936, Munich Riem overprint block multiple, a number of winter help work stamp booklet, numerous Hitler souvenir sheets and much further material. Perfect for liquidation, very favorable!